The Concerto Competition Concert features six student soloists performing with the UGA Symphony Orchestra on Jan. 24 at 7:30 p.m. in Hodgson Concert Hall. Six student soloists will join the Hugh Hodgson School of Music’s UGA Symphony Orchestra for the annual Concerto Competition Concert. The musicians will take the Hodgson Concert Hall stage Jan. 24 at 7:30 p.m. as part of the Thursday Scholarship Series. “This concert is probably the most exciting event that takes place annually,” said Mark Cedel, conductor and director of orchestral activities. 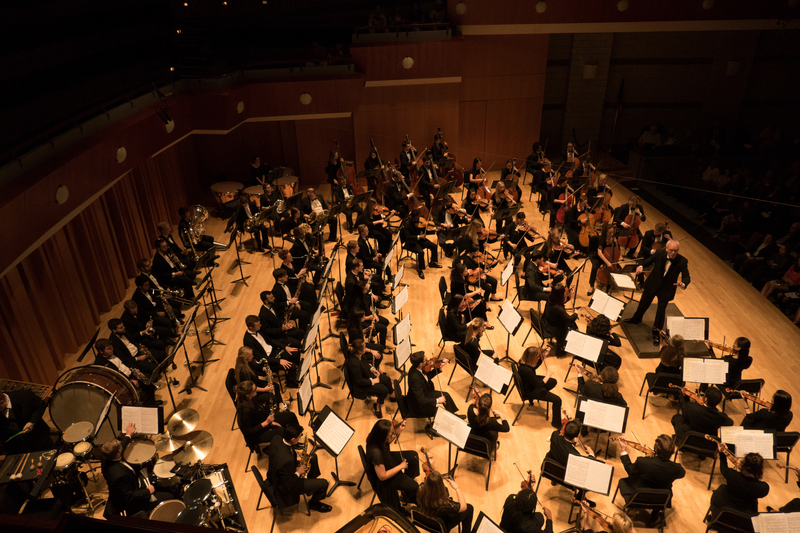 Students from all degree programs compete to perform with the orchestra, and the soloists performing in the concert were selected after advancing through a rigorous competition process within the School of Music. The winners are ranked, and then the committee goes down the list until the time limit for the concert is met. Opening the concert will be violinist Fei Tong. A native of China, Tong was the first prize winner at the 2018 America Protege International Competition of Romantic Music. She has performed as a soloist with the Harbin Symphony Orchestra, among others, and has collaborated with many distinguished musicians such as David Holland and Alicia Valoti. Saxophonist Dan Phipps, a second year Master of Music student and aural skills teaching assistant, has participated in many festivals, such as the Vienna Summer Music Festival and the American Saxophone Academy. Phipps has been a first-place winner of the MTNA Young Artist Woodwind Solo Competition twice. Cellist Andrew William Reynish already has been enjoying a career as a soloist and chamber musician. He began his master’s degree at UGA this past summer after attending both the Chetham’s School of Music and the Royal Danish Academy of Music. Eastman Saxophone Project and the tenor saxophonist with the Fuego Quartet, Clarke said he is excited to be part of the quartet’s debut album this year with PARMA Recordings. Brazilian Deusiel de Souza, who is pursuing a master’s degree, also performs as a clarinetist with the Brazilian Air Force Band after having placed first in auditions for that band and the Brazilian Army Band. He has performed as a soloist in one of Rio de Janeiro’s most important concert halls, Sala Cecilia Meireles, with the Symphonic Band CETEP of Marechel Hermes. Chinese pianist Zhirui Zhou has been studying the piano since age 5. Having studied at several schools and conservatories, Zhou is no stranger to major competitions. She won the Schwob School of Music concerto competition twice and received the third prize at the International Piano Competition in Italy, among others. Zhou is currently working towards her doctorate under piano faculty David Fung. “It is always a very eclectic mix of instruments,” said Cedel. With the variety of repertoire chosen by the soloists, the UGA Symphony Orchestra has their work cut out for them according to Cedel. “The accompaniments can be very challenging in their technical and musical demands and it’s our job to make the performances successful,” said Cedel, who will be joined by graduate student and assistant conductor Jean Gomez. Tickets for the concert are $20 for adults and $6 for students and children and can be purchased online at pac.uga.edu or by calling the Performing Arts Center box office at 706-542-4400. All proceeds from ticket sales go directly towards funding student scholarships. For those unable to attend the concert, live streaming will be available at music.uga.edu/live-streaming.